Illegal Aliens To Receive 650 million in Welfare Payments From JUST ONE COUNTY! Granted, we are talking about one of the biggest illegal alien hubs in the country in LA County, but it’s still ridiculous that American citizens are expected to pay 650 million dollars a year to take care of freeloaders who aren’t even supposed to be in this country. A projected $650 million in welfare benefits will be distributed to illegal alien parents in 2013, county officials said Monday. 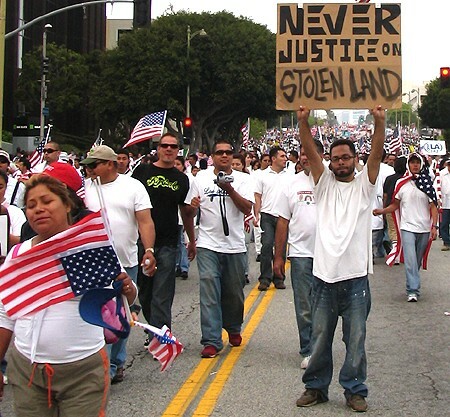 …An estimated 100,000 children of 60,000 undocumented parents receive aid in Los Angeles County, according to Antonovich, who said this year’s projections – up about $1 million from the nearly $53 million in total benefits issued in July 2012 – underscore the economic impact of the nation’s immigration debate. But wait, I thought we’ve been told this doesn’t happen? I thought illegal aliens were supposed to be a huge economic benefit to Americans? Well, how much of a benefit are illegal aliens in LA county, where they’re leeching over a billion dollars a year from the wallets of productive Americans? Here’s a crazy thought: Maybe making these welfare recipients citizens isn’t the smartest idea in the world.